You know life is good when one of your privileges gets tweaked and almost everyone tells you they feel your pain. A Toronto Star article last Friday --- based on City data obtained through a Freedom of Information request --- showed that motoring travel times have increased on Bloor St. along the pilot bike lane; while cycling numbers are up significantly. Other media were quick to follow up with their own stories about the scandal. The headline by Global News was typical: “Bloor Street bicycle lanes have increased driving times.” The City, presumably anticipating the Star article, on the same day published its own ‘update’ about the bike lanes, including assurances that changes were coming to smooth the flow of (car) “traffic.” Only later in the day, during a full house for a Bloor bike lane forum (part of a farewell for the Honest Ed’s store), did motorists get a less sympathetic audience. It’s no surprise that the increase in car travel times along the bike lane --- four minutes in the morning rush hour and 8.5 minutes in the afternoon one --- would rile elements of the motoring majority even though the idea of a pilot is precisely to test projects in real world conditions and then to make improvements. Lost in the hoopla was the fact that thousands of cars appear simply to have disappeared from Bloor. Motor vehicle volumes have dropped from 24,500 to 20,000 without detected increases elsewhere. Longer driving times on Bloor appear to have sent a signal to motorists that other long-standing, polite exhortations --- to walk, cycle, car-pool, take transit, or drive in off-peak hours --- failed to achieve. Councillor Joe Cressy, one of the five speakers at the forum (along with Nancy Smith Lea, Toronto Centre for Active Transportation; Jacquelyn Hayward Gulati, City of Toronto; Jared Kolb, Cycle Toronto; and yours truly), articulated the fundamental problem with his own numbers: downtown Toronto’s population grows from 250,000 to 900,000 people during the average weekday so focusing on moving people, instead of cars, is a better route toward transport success. Indeed, many cities have long ago come to the same conclusion and use taxes or tolls (or just block cars altogether from core areas) to stop people from driving downtown. For the most part, Toronto still apologizes whenever the privileged status of motorists is affected, even though most travel alone in over-sized vehicles. The result is that Toronto’s ambitions for safer public roads, more green space, or a faster ride on transit are consistently thwarted. Hayward Gulati, Acting Director, Transportation Infrastructure Management, confirmed that various operational improvements will be implemented on Bloor at trouble spots near Avenue Rd. and Bathurst St. The timing of signals and design adjustments to facilitate car turns are among the potential changes. When complaints about bike lanes don’t focus on the struggles of motorists, it’s instead the preoccupation with any loss of parking for shoppers arriving by car. Ironically, motorists who rush (or hope to rush) through Bloor neighbourhoods are finding themselves in an odd alliance with merchants whose stores they might only occasionally patronize. Although opposition from merchants is dropping --- only 41% oppose the bike lane while 53% are in favour (6% are neutral) --- the issue usually gets as much attention as complaints about car travel times. The decline in merchant opposition is likely the result of a number of studies by TCAT beginning in 2009. Smith Lea, TCAT director, recalled that she was initially “shocked” at the numbers from their Bloor-Annex parking study: a mere 10% of shoppers arrive by car. For many years, the accepted --- and unchallenged --- wisdom was that on-street parking was vital for local businesses. One of the City’s first bikeway studies, by consultant Barton-Aschman in 1977-78, rejected Bloor for a bikeway --- despite ranking it at the top for cycling numbers, growth potential, and cyclist injuries --- in large part because of the belief, unsupported by evidence, that less parking would prejudice the survival of local business. Harbord St. was instead chosen, but city bike counts several years later showed that cyclists still preferred Bloor as an east-west route. Some merchants remain unconvinced, or uninformed, about TCAT’s findings. A local video store on Bloor (where I’ve shopped for years) complains in a written notice for customers that the bike lane takes up 25% of road space 24/7, 12 months of the year. Leaving aside some rather obvious changes to consumer choices (like Netflix) the complaint suggests that some merchants still over-estimate motorists’ spending, and have no qualm about scapegoating bike lanes or offending their loyal customers. 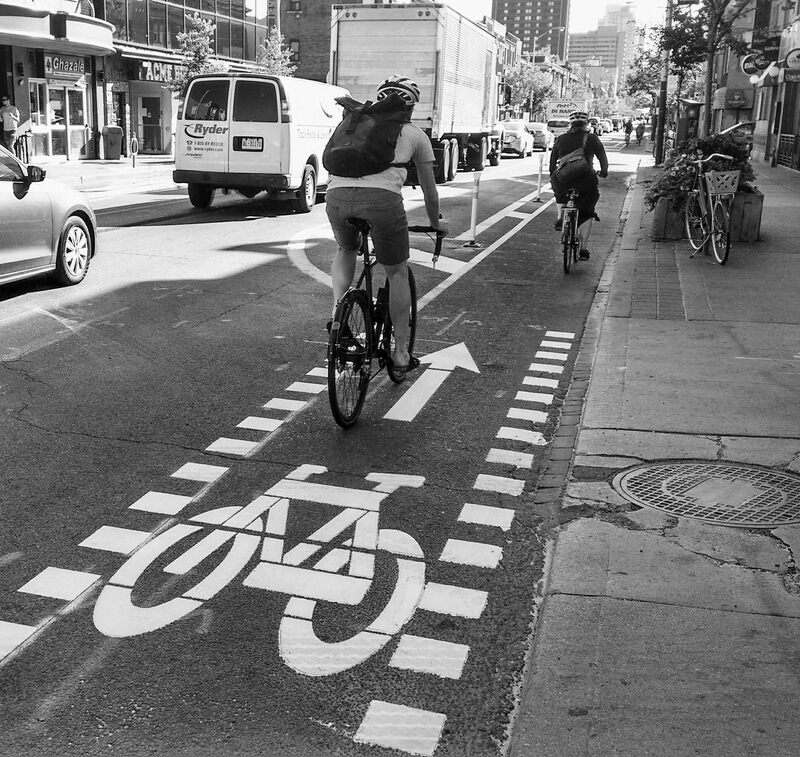 Most people will likely accept adjustments to the Bloor bike lane that make life easier for motorists without compromising cyclists’ safety. Amidst the recent brouhaha it’s worth remembering, however, that Toronto residents who cycle (pay taxes, vote, and face a disproportionate number of injuries) still benefit from bike lanes on only 2% of the road system. Cyclists can’t yet even dream of equality on our roads but if improvements on Bloor don’t substantially decrease motoring travel times, isn’t the bike lane nonetheless a small step in the direction of safety and fairness? Albert Koehl is an environmental lawyer and co-founder of Bells on Bloor. 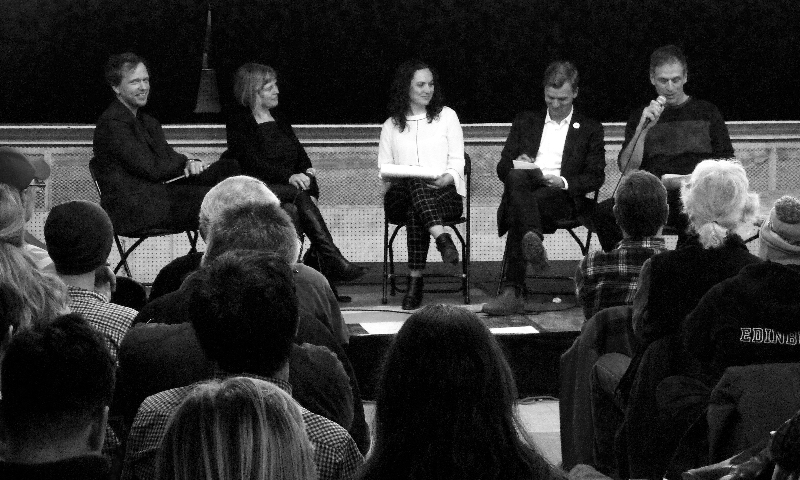 He was one of the five panel members at the Bloor bike lane forum on February 24, 2017 at Honest Ed’s.